Disney and Pixar have released a brand new poster for The Incredibles 2. Of all the movies Pixar has ever produced, perhaps no movie is more deserving of a sequel than 2004's The Incredibles. It may have taken 14 years, but we're finally getting that long-awaited sequel this summer, with the majority of the original cast and original director Brad Bird all on board. Now, a brand new poster has made its way online, teasing that it's time for our heroes to get back to work. Though, it might not be the kind of work you're expecting. 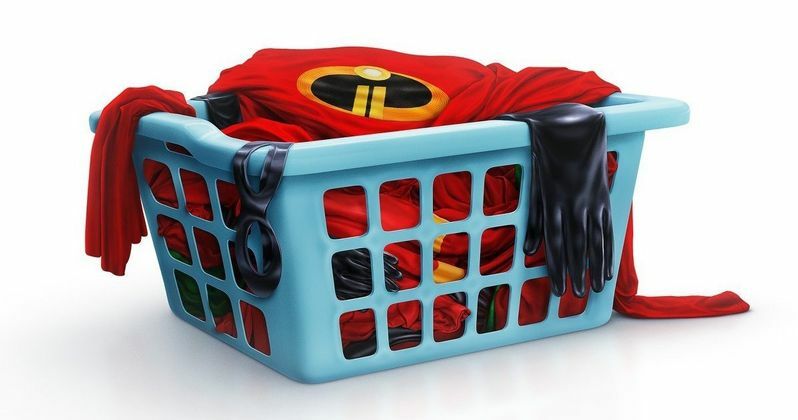 The new Incredibles 2 poster features all of the family's super suits in a laundry basket. We know that the sequel is going to pick up directly after the events of the first movie, but the dynamic in this installment is going to change dramatically. This time around, Bob, aka Mr. Incredible, is going to have to stay at home and take care of the family while Helen, aka Elastigirl, is in the spotlight. This poster is clearly playing on the idea of a domesticated Bob, who's likely going to have a tough time with the situation, given how happy he was to be back fighting crime in the first movie. So far, the footage that has been released for Incredibles 2 hasn't told us all that much, other than the fact that Jack-Jack is going to reveal his many powers to the family. Considering the sequel is slated to arrive in theaters June 15, it seems like the studio may be trying to keep quite a bit under wraps. Though, we are going to be treated to a new look at some footage during The Olympics on February 14. It's likely we'll be seeing some significant footage from the movie at that time, so be on the lookout. Mr. Incredible (Craig T. Nelson), Elastigirl (Holly Hunter), Frozone (Samuel L. Jackson), Jack-Jack (Eli Fucile/Maeve Andrews), Violet (Sarah Vowell), Dash (Spencer Fox) and Edna Mode (Brad Bird) are all back for Incredibles 2. As for director Brad Bird, this marks a return to his animated roots. He had an incredibly successful early run of his career, helming movies like The Iron Giant, Ratatouille and The Incredibles. He then took a break to do some live-action in the form of Mission: Impossible - Ghost Protocol, which went over quite well, and Tomorrowland, which didn't go over so well. Incredibles 2 is poised to potentially be one of the biggest hits of the summer movie season. But can it really live up to the legacy of the original? There's certainly a great many hopeful fans that believe it can, and we don't have to wait that much longer to find out if this is going to be the sequel we've all been waiting for. We'll likely have a much better idea once the new footage arrives on Wednesday. Be sure to check out the brand new poster for Incredibles 2, courtesy of the Disney•Pixar Twitter account, for yourself below.